As you may or may not have known, my wife and I spent a week out of town recently, which can be a perilous thing when you take care of five cats. Not that they weren't well taken care of by my mother in law, but we still expected to be shunned like lepers when we came back. That's usually how it works: we arrive home, excited to hug them all on a rainbow, and they refuse to have anything to do with us. I figure it's because they had come to terms with our demise and were trying to sever any emotional attachment they may have had and our sudden reappearance takes some getting used to. Or they're just punishing us for having the audacity to not take them anywhere, even though attempting to get them into a car should be rewarded with medals and special recognition from Congress. The last time I took Icarus to the vet the lacerations on my arms ended up getting more medical attention than he did. They are a confusing bunch. If you want a cat that makes sense you should probably get a dog, or one of these sweet plastic ones from Konatsu. 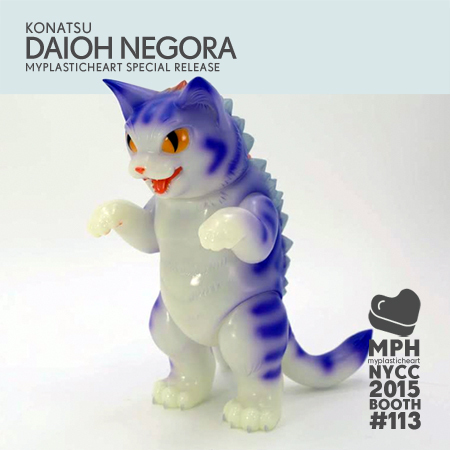 myplasticheart will be doing a special release of this mega Daioh Negora during New York Comic Con and it is at the top of my list of things to try and get. Hopefully everyone will be busy taking pictures of the thousand or so girls dressed as Harley Quinn and I can slip by without any problem, claim my prize, and celebrate with a mighty feast of convention food.